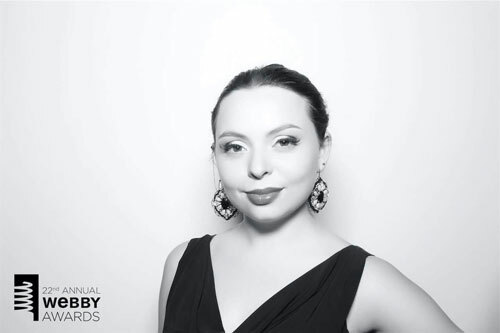 A City alumna has scooped a Webby Award for her social media work at BBC Culture. Sophia Smith Galer, (MA, Broadcast Journalism, 2017), and her team were presented with the People’s Voice Webby Award at a star studded event at the Cipriani Wall Street in New York City. Sophia, who rubbed shoulders at the event with the likes of actress Laura Linney, singer FKA Twigs and Stranger Things’ David Harbour, was awarded for her work at BBC Culture, which covers topics across art, film, music and literature. Sophia said: “I graduated last year on a Friday and then the following Monday was my first day at the BBC, so there was not much resting time between university and my career! “As a social media producer, you are given a lot of responsibility to really get creative with the channels. One of our most successful pieces of content was a video about Jane Austen characters and what they might have behaved like on Tinder – so it is very flexible. “Everyone at the Webby’s had the fundamental aim of making the Internet a better place; it’s a worthy mission and one that will always be central to my career in journalism. “Our award was for the People’s Voice category, so it is great to see that our audiences are quite invested in what we have been putting out on social media. I’ve overseen everything from polls to videos on our channels, so we have really done a great job in creating an online community with our followers across several platforms.